Strong Bad is a smasher from Lees Summit, Missouri who is currently residing in Northern California. He was a member of the PM Dev Team, and is known for being one of the primary developers of the mod Project M, as well as one of the top Wario players. He formerly played Donkey Kong in both Melee and Project M but switched to Wario in Project M and rarely enters Melee tournaments anymore. 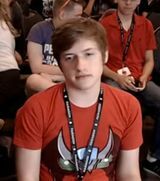 Strong Bad was formerly ranked 1st on the DFW Project M Power Rankings. He was the head organizer of PMRank 2016 and PMRank 2017. EXPosure 6 December 28th, 2013 4th 1st Oro? !